Despite above-average precipitation, all of the High Plains Water District (HPWD) service area was experiencing drought conditions at the end of 2017. Most of the District is currently under severe drought status, according to the U.S. Drought Monitor. 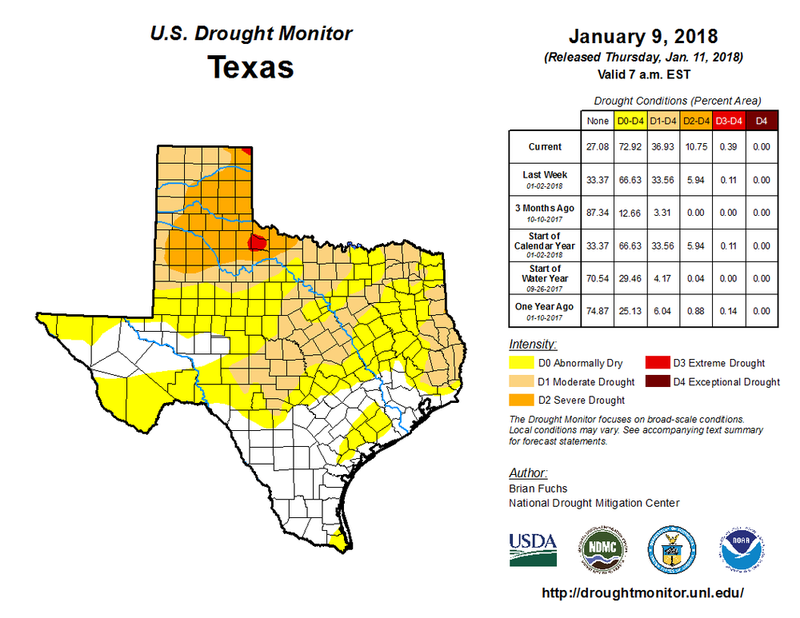 Deaf Smith and Parmer Counties, along with portions of Bailey, Castro, and Cochran Counties, are classified under moderate drought conditions. Though most of the HPWD service area received above-average rainfall in 2017, the majority of the precipitation was received throughout the first nine months of the year. Castro County had the greatest deviation from the annual precipitation average. It received 26.47 inches of rain last year, which is 13 inches above normal. Lynn County was the only county that experienced a precipitation deficit, nearly four inches below average. So, what is in store for 2018? The dry La Niña pattern is expected to stick around until April, according to the National Oceanic and Atmospheric Administration (NOAA). KCBD-TV Meteorologist Steve Devine said precipitation will likely be below average through the summer. Fall and winter 2018 precipitation may trend toward average. Temperatures for 2018 are expected to be above average as a whole. With this in mind, HPWD encourages everyone to be aware of their water use during these dry times! Be aware of your local landscape irrigation ordinances, and abide by them. Make sure your lawn irrigation system is off during the winter.